I will be hiring an articling student next month. 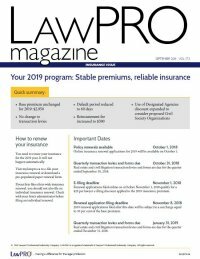 Does LAWPRO cover the work done by the articling student? The primary LSO program POLICY generally insures LAWYERS only. Articling students are not eligible to purchase coverage and are not INSUREDS under the program POLICY. Of course, agency law is likely to apply in the context of an articling student who is working directly under the LAWYER’S supervision and control, so much of their exposure is likely to be picked up under the LAWYER’S program coverage. LAWPRO would provide coverage to the INSURED LAWYER to the extent that the LAWYER is liable for the activities of the articling student. We are a small partnership (not a MULTI-DISCIPLINE PARTNERSHIP) of five LAWYERS who have hired a chartered accountant to join the LAW FIRM to provide services on files under the supervision of one of the LAWYERS. Is there coverage under the primary LSO program POLICY for the services provided by the chartered accountant? The primary LSO program POLICY usually just insures the LAWYERS in a LAW FIRM, unless a MULTI-DISCIPLINE PARTNERSHIP or a COMBINED LICENSEE FIRM, in which case, non-LAWYER partners (or possibly shareholder, in the latter case) would also be INSUREDS and afforded protection under the program POLICY. Accordingly, a chartered accountant employed by a LAW FIRM that is not a MULTI-DISCIPLINE PARTNERSHIP who provides services on client files solely under the supervision of a LAWYER, would not qualify as an INSURED and would not be afforded protection under the program POLICY. In fact, it would be expected that the non-LAWYER professional would carry his or her own professional liability insurance, and indeed, that individual may have a professional obligation to do so. To the extent that the POLICY coverage is triggered and LAWPRO affords protection to the INSURED LAWYERS in the LAW FIRM against liability for the activities of the accountant, it would be available to LAWPRO to pursue the accountant for his or her own liability. Does the primary LSO Program POLICY cover the work done by a law clerk or PARALEGAL? So, unless a partner in a MULTI-DISCIPLINE PARTNERSHIP or a partner / shareholder in a COMBINED LICENSEE FIRM, a law clerk and PARALEGAL would not qualify as an INSURED under the program POLICY. Of course, agency law is likely to apply in the context of a law clerk, paralegal, or other law office staff (including articling students) who is working directly under the LAWYER’S supervision and control, so much of their exposure is likely to be picked up under the LAWYER’S program coverage. LAWPRO would provide coverage to the INSURED LAWYER to the extent that the LAWYER is liable for the activities of the clerk, paralegal or other office staff.